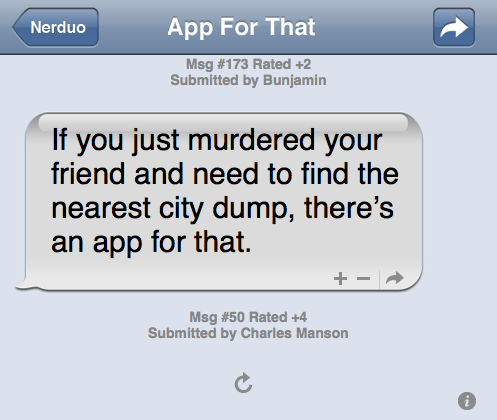 Need A Witty "App For That" Phrase? There's An App For That. I’m a big fan of coming up with ridiculous “App For That” headlines. You know, the kind that mock Apple’s iPhone App Store commercials that basically proclaim there’s an app for everything you could ever possibly want to do. So it brings me great pleasure today to report that the next time I need one of those headlines: There’s an app for that. App For That, is a website that gives you a series of user submitted “App For That” jokes, which you can vote on, tweet out, email, etc. The service looks like the iPhone’s text app, with submissions written in chat bubbles. Below that is a submission form for your own jokes.